It is the time of the year again when mercury drops and autumn leaves fall. Bureau of Meteorology heralds climatic news of precious sunlight, howling gale, chilly wind and frosty night. Melbournians armour themselves in multiple layers in preparation of vigorous battles against notorious weather. It is the time again when forecasted temperature determines our daily schedule, electric heaters recommence their duties, and microfiber duvets find their way out from storage boxes. Winter, is here. Undeterred by the formidable degree of Celsius, young skating rangers fully girded in bright orange helmets are all too eager to perform a spin or two at the pop-up River Rink. Interesting food stalls formed a delicious culinary line along the Yarra River, offering range of all-time favourite delights including Movenpick Swiss Ice Cream, Turkish Gozleme, Belgian waffle on a stick, German hot dogs, crème brulee, and French raclette. Further north of the Square near the fancy East Shard building, the Leempeeyt Weeyn, an indigenous campfire, is burning and emanating welcoming warmth to a bunch of happy people. 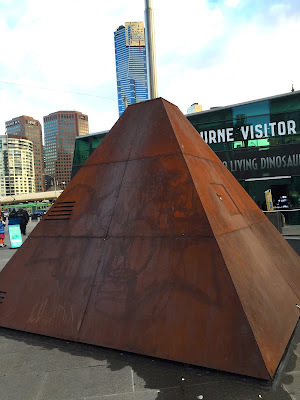 At the northwest corner of Federation Square, right next to the translucent info-hub building, a seven-metre Giant Theremin sits in isolation like an obscure pyramid sculpture. Designed as a fun and interactive musical instrument, this gigantic object creates symphony of sounds when movement is detected within its close proximity.